I just created an epic tutorial on How to Create and Give-Away a Lead Magnet (content upgrade). In the post I walk you thru how to do it step by step. There is no tip left out. However, there is so much more to say on the topic. What makes a content upgrade epic? What makes a content upgrade ahMazing? 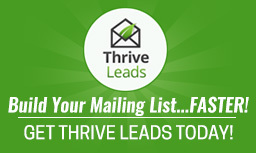 Are you ready to create a lead magnet but are not sure what it should be? The tech is not the most difficult part of lead magnets. The most challenging part is what the heck should it be? When this whole "Content Upgrade" concept came out, everyone was giving away e-books. It was an exciting time. But then e-books stopped working. Why? Well, people didn't have time to read each and every book that they downloaded. It actually started to be a bit depressing. Too much great content to consume can start make a reader frustrated. When people come to your blog, they want answers. They don't want a friggin book. They just want that one answer to that one question. So give your readers what they want. Readers love resources. This may sound too simple but it is not. Open up a Word document and create a list of resources that is related to your specific blog post. DO NOT overthink this. Just create it and then give it to them in exchange for an email address. If your blog post is epic, truly epic then give it to them. Create a pdf download of your blog post for free and quickly. Here is the perfect tool: http://www.printfriendly.com/ and it is FREE. 3. Give them a step-by-step guide. If you are telling your reader that they should do something, provide them with the instructions in a pdf download. Are you blogging about how to cook or how to build something? Give them the instructions in a quick and easy guide. Do not overcomplicate this guide. Make it a list of steps. Give them any important notes and leave it at that. Your readers will love you. Create a video that shows your reader exactly what you mean. Don't just tell them how to do something but use video and show them. Sometimes a visual can tell the story so much better. Now that you have 4 new ideas on content upgrades, what will you do? How will you grow your blog?